How Does Toyota Keep 6,000 Delinquent Customers In Their Cars While Avoiding Millions of Dollars a year in Losses? For auto lenders such as Toyota Financial Services (TFS), striking the right balance between growth and risk means making profitable lending decisions. TDS was challenged with trying to balance growth and risk within its lending business and the decisions it previously made created an unacceptably high amount of delinquencies and repossessions for its customers. Keep more than 6,000 drivers in their cars, while 1,500 customers avoided reaching a stage of repossession. Reduced operating expense and grew its portfolio by roughly 9 percent without adding collections headcount. 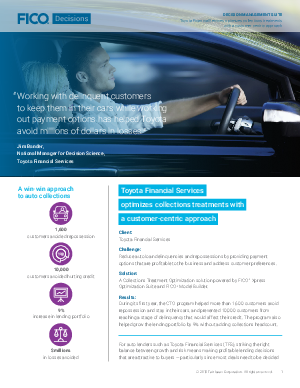 Tied future lending decisions to its collections abilities, putting more customers behind the wheel of a Toyota. Download the case study which describes how Toyota applied a collection optimization-based approach using data science to keep delinquent customers in their cars.